Situated on 16 acres, Washington Marriott Wardman Park is a historic landmark hotel in Northwest DC. With a blend of charm, modern elegance and a historic landmark setting, this northwest DC hotel's stunning guest rooms, extensive event space and impeccable service make it the perfect choice for business and leisure travelers. WASHINGTON, DC--(Marketwire - Nov 1, 2012) - Washington, DC, full of cultural activities, is a great travel spot for the entire family. One exciting family activity is the Kids Euro Festival, one of the country's largest performing arts festivals for children, occurring through November 14, 2012. The Washington Marriott Wardman Park hotel, a DC hotel near Embassy Row, offers ideal family accommodations near the event locations, as well as many area sights and attractions throughout DC. The Kids Euro Festival features free performances, workshops and screenings for children. Attendees will also enjoy storytelling, puppetry, dance, magic, and wonderful cinema. The festival is presented by the 27-member countries of the European Union and organized by the French-American Cultural Foundation in collaboration with 16 cultural institutions in the DC area. This family friendly hotel in DC is located in Woodley Park and features a metro stop steps from the hotel entrance. Its easy access to DC's museums, sights, and area attractions provides access to all the dining and cultural options DC has to offer, in addition to the Kids Euro Festival. 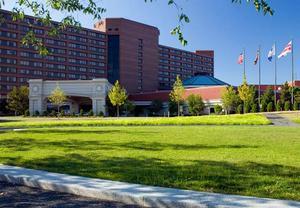 Situated on 16 acres, Washington Marriott Wardman Park is a historic landmark hotel in Northwest DC. Each guest room at this hotel near Embassy Row in Washington, DC features luxurious bedding, 32" HDTV, plug-in technology to integrate personal electronics, and modern bathrooms with granite countertops and a spa-like shower. Guests will love the 3,000-sq-ft fitness center featuring state-of the-art equipment, a new cardio theater, sauna, and steam room. The Lobby Bar is great for catching up with family and friends. Harry's Pub serves light fare and a variety of beers on tap and Stone's Throw Restaurant features steaks, chops and seafood dishes with fresh, regional ingredients. When looking for a DC hotel with great amenities near area sights, the Washington Marriott Wardman Park hotel is an ideal choice. For reservations, please visit http://www.marriott.com/hotels/travel/wasdt-washington-marriott-wardman-park/ or call 1-800-228-9290 in the U.S. or Canada. Among the most sophisticated hotels, Washington Marriott Wardman Park rises above the rest. With a blend of charm, modern elegance and a historic landmark setting, this northwest DC hotel's stunning guest rooms, extensive event space and impeccable service make it the perfect choice for business and leisure travelers. Situated on 16 garden acres, this hotel has hosted a long list of Presidents, dignitaries and VIPs. With 1,314 guest rooms including 125 VIP hotel suites in DC, plus an outdoor pool and sundeck, it's the perfect place for vacationers to enjoy their down time. Families will enjoy our close proximity to the National Zoo and other top area attractions. With 195,000 sq ft of event space and 95,000 sq ft of exhibit space, meeting and conference planners find a perfect venue for events of any size. Additionally, the comprehensive conference services and expert staff ensure that every event runs smoothly and flawlessly.